And anyone, who knows me at all, can attest this to be nothing but the truth. But you know how they say genes skip a generation, right? So, ya, in short, the princess loves the kitchen and all that comes with it, making her maternal grandma weep tears of long-lost joy. And this phase, I believe, began around three years ago when she first chanced upon an episode of MasterChef Australia. Needless to say, she was hooked, booked and cooked. And since we follow the ‘one TV for the home’ rule ( No separate television sets in our bedrooms), the husband and I got pulled into watching it as well. As MasterChef Australia progressed, it translated into family time for us, with Gary Mehigan, George Calombaris and Matt Preston pretty much our ‘new-found cousins’. We followed their escapades all through the contestants’ journeys. We were intrigued by the approach to the recipes, the well stocked market-place, the challenge of the timer, the final plating, the stress of delivering a good dish, the anxiety of the outcome with the final tasting, and the immunity weapons. Phew! Yes, well, we were hooked, booked and cooked, too (metaphorically, of course) across the seasons. Then when Junior MasterChef happened, the princess graduated to making gooey brownies, and instant cakes in a CUP. They are different from cup cakes, she tells me with a roll of her eyes. Her breakfast and snack concoctions were lip smacking as well. She loved experimenting, and I have to admit, knew much more in this sector than I ever hope to. The pride that I saw in my mother’s eyes is something I have never witnessed in my lifetime. They went on from sharing recipes to borrowing ingredients and being on speed dial for a ‘dish in progress. I was not consulted and nothing could make me happier. Who wishes to chart routes on unfamiliar territory? Life was good as we knew it, until last Saturday when the princess spotted this. The billboard might as well have been the map to the Holy Grail. The princess, along with her equally enthusiastic girlfriend, went all girly (read loud screams) when they saw the ad. It was a culinary event, pretty much in our backyard, with the 4 finalist chefs from Master Chef Australia 2014. 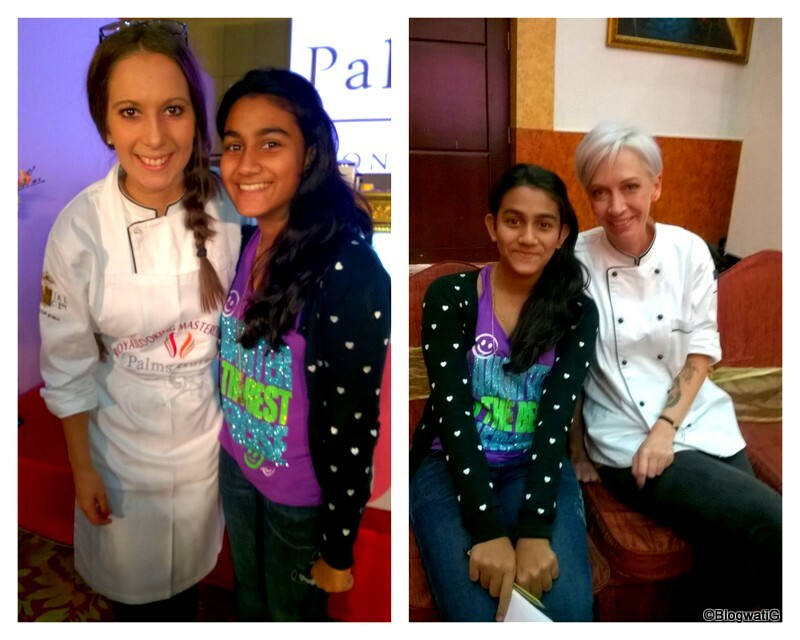 After some chain reactions of OMGs, and before we could say Gary, George or Matt, the girls were scheduled to attend a cooking demonstration with Renae Smith and Laura Cassai on Sunday afternoon, January the 18th, 2015. God bless online booking forums, and school gate moms who step in when you need them the most. Preeti, Je t’aime toujours. Well, the event flow showcased cuisines from different countries, by way of an Entree, Main Course and Dessert in the preparation menu. The audience was welcome to experience, learn and interact with the chefs in the house. The girls could barely contain their excitement. All through the event, I am told, they scribbled down some illegible notes, as they tried to keep pace. Of course, the event was just a ruse really, to meet the two lovely ladies. And then, as slowly as time could turn around the still digits of the clock, it did. Finally, it was TIME. The princess got to meet Renae and Laura. She was totally smitten by Laura, and asked if she could hug her. Laura, ever so gracious, went on to give her a big bear hug and took some snapshots as well. The delight on the princess’s face is unmistakable, and there for all to see. What was even more awesome was that Laura and Renae liked her post on Instagram. Oh boy, we were over the moon for the next day and a half. Ask her what she remembers of the afternoon and she replies ‘Mom, it was one of those awesome moments in life’. And don’t we remember such moments, specifically, at any point of time? The recipes are safely tucked in her scrapbook, just as the memory is in her heart. In other news, Masterchef India – Season 4, the desi version starts today with Chef Sanjeev Kapoor, Chef Vikas Khanna (awwwwww) and Chef Ranveer Brar. I’ve had the good fortune of meeting two of the three judges, and I can vouch for the fact that the contestants are being honed by the best in the food industry. This season is an entirely vegetarian fare, and it is going to be interesting to see what the contestants come up with, limiting as the choices are. Or are they? Only one way to find out. Tune in to Star Plus at 10.30 pm if food occupies prime time in your life. This is excellent!! I am a MC Australia fan …more that the indian version. And by the way Matt, Gary and George happen to be our cousins too 😛 Didn’t know we were related. Anyway, so the little princess in my house is as hooked on to the series too and I hope she gets to learn a few tricks and surprise (ahem!) me as well. Having said that , this was great for T to be able to be in the company of the contestants from one of my favourite shows…Sooooooperb!! Oh, T was thrilled to bits. We have only been going on and on about it, and it’s been a week already. Will take time to subside, this excitement, I tell you. As a MC Australia aficionado, needless to say, I’m experiencing a bit of a ‘jealous’ moment/ But so happy for the little princess. I’m not a big fan of the Indian version, but the all-vegetarian fare seems to be intriguing enough for me to watch. Ah, the world is a small place after all, no? 😀 I can imagine you going a wee bit ‘green’ on this one. Talking about green, yup the Indian Veg fare does have my interest piqued, too. Matlab, how much and how far can they stretch this is what I wait to see. I think I should watch Master-chef India just so that I can drool over Vikas Khanna. « Tisca Chopra asks – Acting Smart?